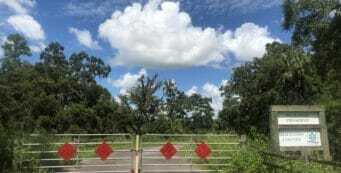 Sholom Park | Florida Hikes! 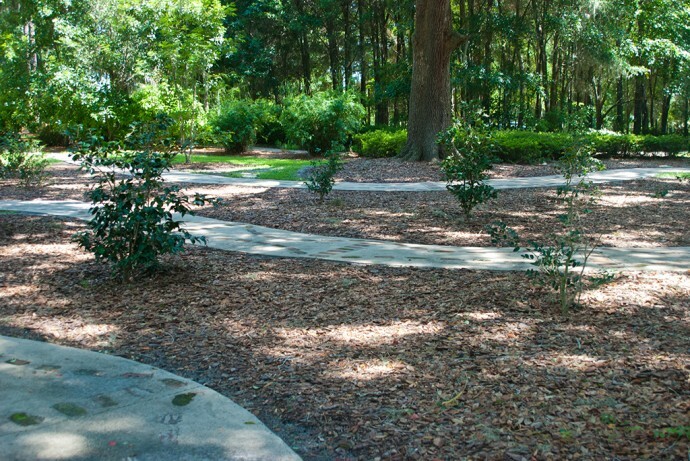 Meditative walking: that’s what’s expected at Sholom Park, a private sanctuary that opens its gates daily for the public to enjoy its quiet, well-manicured 45 acres of hardwood hammocks, climax sandhill forest, massive grassy lawns, and landscaped thematic gardens. While children are welcome, this isn’t a place to run around and make noise. 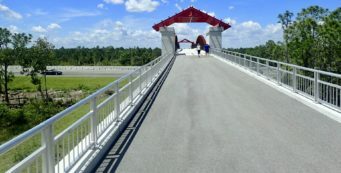 Instead, visitors are asked to walk softly and reflect as they explore nearly 2 miles along paved trails. Dogs and bicycles are not permitted at Sholom Park, but the paved trails are perfect for wheelchairs and strollers. The park is open from 8 to 5 daily, with extended hours until 7 PM during daylight savings time. From Interstate 75 exit 350, follow SR 200 (SW College Rd) southwest for 3.9 miles through commercial and residential areas west of Ocala. Shortly after passing Queen of Peace Church, turn right on SW 80 Street and follow it 1.5 miles through a residental area. At the traffic light with SW 80th Avenue in front of Circle Square Commons, turn right and drive north. The park entrance is on the left after 0.7 mile. 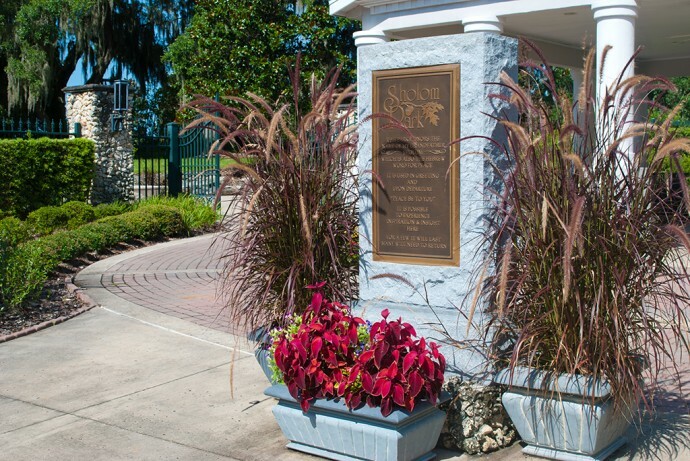 Follow the park road into Sholom Park and choose from paved or grassy parking spaces. 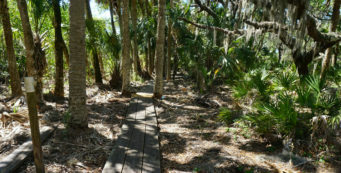 There are many directions you can go and many paths you can take at Sholom Park, so this hike is simply our recommended route through the 45-acre park. Start by walking up to the pavilion, where you can sign the guest register and pick up a map. You’ll find restrooms and water fountains in this central location. Turn left and face the fountain to enter the Formal Garden Walk. This is one of the most cultivated areas in the park, with changing beds of flowers and perennial foliage based on the season. Directly ahead are live oaks draped in Spanish moss, forming a frame for the garden view and deftly hiding the development beyond. You pass the first of many benches along the pathways of the park. Where a gravel path goes to the left, you come to a fork in the sidewalk. Keep to the right. 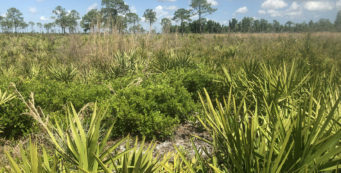 The plantings throughout the park are a mixture of Florida natives and flora that requires little to no watering. Dense clumps of saw palmetto hide the bases of the oaks. Hedges of azalea and boxwood form sculpted garden walls. There are many Southern magnolias, resplendent in aromatic blooms by late spring. The landscape dips to the left towards a sinkhole under the oaks. The path curves to the edge of this formal area. Turn right and follow the path through a gate. Walking beneath a very large hickory tree, you enter the Azalea Trail, where the blooms beneath these grand live oaks are at top form in February and early March. Past a bench set in a nook, at a junction of paths, a piece of statuary honors one of Sidney Colen’s friends. Having established the surrounding On Top of the World retirement community in the 1970s, this park was also his vision as a peace park, a place for reflection. Continue straight ahead. The trail leads you downhill where a bench is set in a glade of ferns. You’re on the outside of the Labyrinth looking in. It’s one of the busier destinations in the park, particularly popular with children. At the fork in the trail, keep right. After 0.2 mile, you enter the Labyrinth through a pergola covered in ivy. This is an out-and-back walk along the swirling brick pathway. With other people on the path, it makes the walk all the more interesting to follow. The many signs along the Labyrinth invite you to stop at various reflection points – such as the Wounded Heart Tree – and look at life from a different perspective. Longleaf pines tower over the neatly landscaped forest floor. 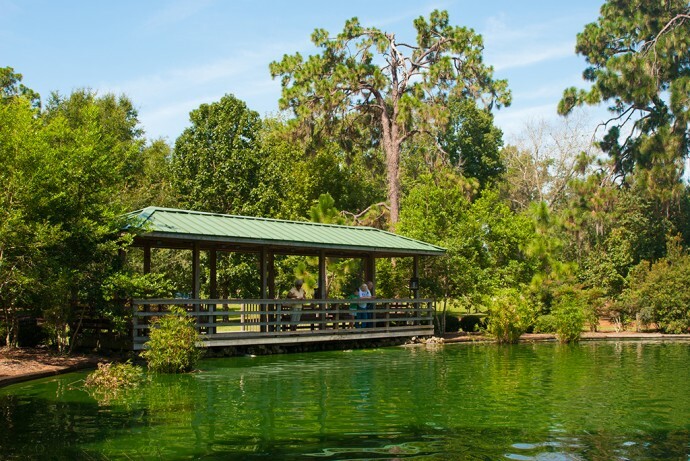 Along this serpentine route, there are benches and arbors and man-made water features, plantings of camellias – which bloom in January and February – beneath a canopy of live oaks laden with Spanish moss. At the heart of the Labyrinth, the brick path leads you around the “Resting Tree,” an immense hickory circled with benches, as it guides you back out the very path you used to walk here. As you walk back and forth through this garden once more, you inspect it from every angle. Reaching the entrance pergola after 0.7 mile, turn right. 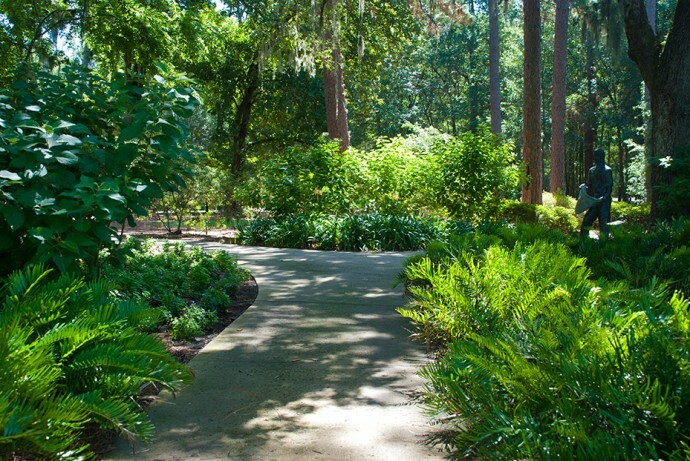 This path runs along the fenceline, with American beautyberry on one side and sword ferns on the other. Passing a bench, the trail loops back, rejoining the path that brought you to the Labyrinth. Continue straight ahead, past the fern glade, to the intersection with the statue. Turn right. Walking in the shade of the oaks among the azaleas, pass the next trail junction. A pathway comes in from the left and you emerge along the edge of the parking area. Follow the path back past the pavilion to access the other, more expansive side of Sholom Park. 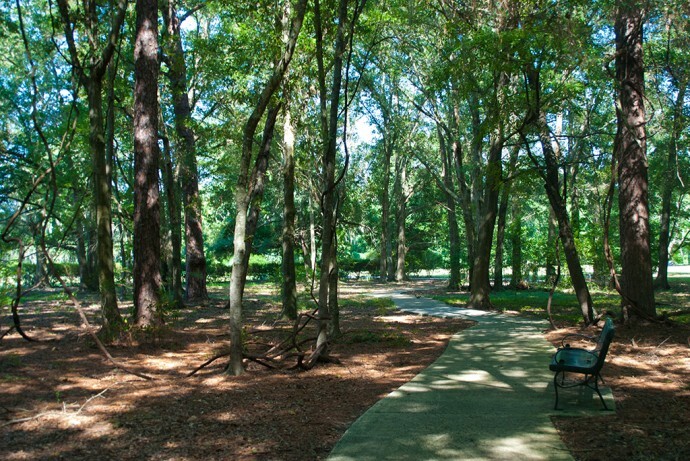 Beyond the pavilion and car turnaround, turn left at the first break in the hedge and follow the path downhill into a vast, open setting on the Prairie Trail, where open grassy areas are edged with drought-resistant flower beds and longleaf pines tower over the trails. A path leads off to the left to a performance stage. Continue straight. At 1 mile, you reach a triangular junction at a grouping of trees. To walk the perimeter of the park – there are other trails that provide shorter walks – keep left. A vast, open green space is off to your right and up ahead. You pass a tablet with an inscribed poem beneath an oak tree, next to a bench, where the Pergebo Trail – lined with olive trees – heads down to the Pergebo, an open-air amphitheater used for weddings. Continue straight ahead. This part of the walk is in full sun, a easy place to notice the intentional impressions of leaves and fronds into the pathway. As the trail gains a little elevation, you can see the Enchanted Forest up ahead. Okay, it’s a laurel oak forest, a climax sandhill, but it has a special name on the map. It also means a return to shade. You come to a trail junction. Turn left to enter the forest. Mistletoe grows profusely in the upper limbs of the oaks, and there are some tall longleaf pines among the oaks. Grapevines dangling down create natural sculptures. The understory has been cleared, so you can see and hear the squirrels digging around. Well overhead, a pileated woodpecker sounds like a doorknocker as it works its way through rotted wood. The path curves to the right and leads you out of the forest, facing the big grassy area, coming to a T intersection with two benches at 1.3 mile. Turn left to rejoin the Prairie Trail. Stepping out into the sun, you’re still walking beneath big, beautiful longleaf pines. As the path is drawing much closer to the front gate, you hear traffic rushing by. Here, the trail is flanked by two big limestone boulders turned into homemade benches resplendent in mosses and ferns. The path curves to the right, away from the front gate, as you come to the junction with the other end of the Pergebo Trail. It’s anchored with a poem about rocks, surrounded by rocks. Continue straight ahead. Although you’re walking on a paved path, the forest floor around you is covered with pine duff. You hear the sound of water as you walk up towards the other child-attracting feature in this park, the Pond. Walk up to the Pond Deck and take a look over the side. The odd tint to the water keeps algae from growing and protects the fish from being easy pickings by osprey and herons. The koi are so used to being fed, they’ll jump right out of the water for food. Turtles will paddle up, too, looking for their handouts. The fish food machine takes quarters. Leaving the Pond Deck, take the time to walk around the pond itself to enjoy the panorama of the park from this elevated perspective. At the far end of the pond, water overflows on its own through a gravel bar when it gets too high. Passing the next bench on the right, continue straight ahead through the four-way intersection back to the parking area, completing the 1.6 mile hike.